Johannesburg (Agenzia Fides) - "We applaud the President and the cabinet for taking the first step towards addressing wage disparities and the plight of the working poor" says His Exc. Mgr. Abel Gabuza, Coadjutor Bishop of the Archdiocese of Durban and President of the Episcopal Commission "Justice and Peace" of the SACBC (Southern African Catholic Bishops' Conference) in a note sent to Agenzia Fides on the national minumum Wage Act which will take effect on 1st January 2019. Mgr. Gabuza, however, emphasizes that the labor department must ensure that the law is respected by all. The President of "Justice and Peace" also notes that "National minimum wage envisages that vulnerable workers would earn R3500 (about 212 euros) a month. To be able to earn R3500 a month, a vulnerable worker would need to work 40 hours a week. A large percent of the vulnerable workers work less than 40 hours a week and would not therefore earn R3500 a month". Secondly, Mgr. Gabuza points out that enforcement issues are still outstanding. CCMA (Commission for Conciliation, Mediation and Arbitration) lacks adequate capacity to meet the rising demand for their services, including enforcement of National Minimum wage. Additionally, the financial and geographical access to CCMA offices and the Labour Department continues to be a problem especially for the working poor in rural provinces". 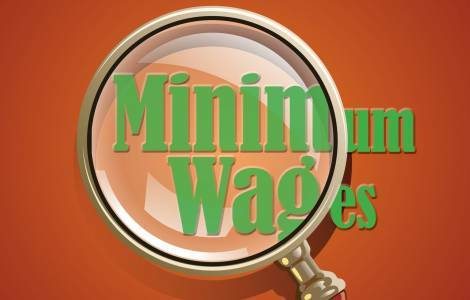 A problem aggravated by the fact that the National Minimum Wage and the Sectoral Determination regime do not have adequate measures to deal with employers who act in bad faith in vulnerable sectors. "In some sectors, the employers have already announced to the workers that they intend to reduce their working hours to a level below 40 hours a week. Other employers especially farmers have announced that, in 2019, they will increase the amount that they charge for electricity, water and loan interest etc. Both practices will erode the gains derived from the national minimum wage and the wage levels in sectoral determination", highlights the note.